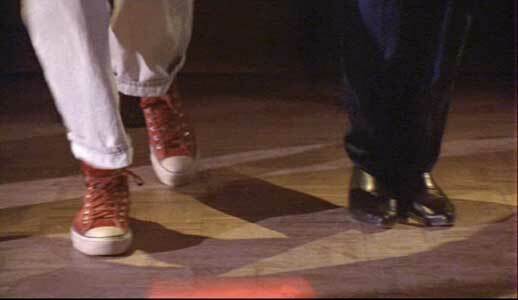 Doug E. Doug and Kerwin Keir wear red high top Converse “Chuck Taylor” All Stars in the film. 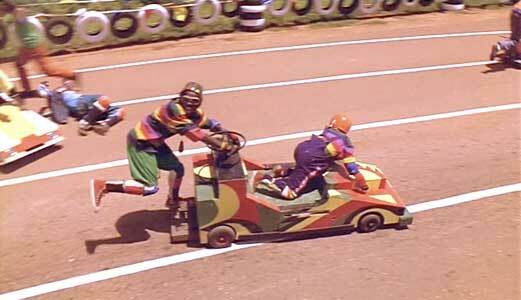 Sanka races with his push cart team. “A true inspiration for the children!” Jamaica, 1987. Derice (Leon) has been training to qualify for the Olympics! His buddy, push cart champ and clown Sanka Coffie (Doug E. Doug), comes to cheer him on. But, rich kid Junior (Malik Yoba) trips, knocking down Derice and bullheaded toughie Yul Brenner (Rawle D. Lewis). But, Derice doesn’t give up hope. He learns that a washed up Olympic champ is on the island, Irv Blitzer (John Candy). 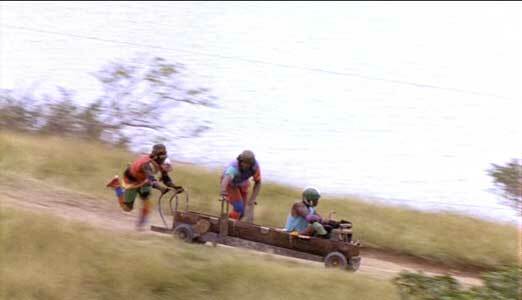 Derice and Sanka recruit Irv to be coach for Jamaica’s first ever bobsled team. Blitzer doesn’t want to, because he’s disgraced and out of shape. He lives in a bar, but he isn’t drunk because this is a PG-rated Disney flick. Blitzer agrees to do it, and they get their team together: Derice, Sanka, and the only other two people who have had dialogue, Yul Brenner and Junior. Very lean, very convenient writing. They begin training. On a bumpy hill they jump in a cart with wheels, and Sanka is put in an ice cream truck for cold-temperature training. They whittle down their push-start time and Irv declares they’re ready. Junior, even though he knows his demanding father will disapprove, sells his car so they can go to Calgary, site of the 1988 Winter Olympics. The newly formed bobsled team begins to practice. In Calgary, Yul Brenner softens, Junior learns how to stand up for himself, and Derice learns that he is true to his Jamaican roots (the weakest part). Sanka remains a clown throughout. He’s their rock. The team works hard, even as the Swiss laugh in their faces and Alliance members regard them with condescension. They get a junker of a sled and name it Cool Runnings. The focus shifts to Irv. He’s an outcast because he had cheated and his team was stripped of their gold medals. Why’d he do it? “I had to win.” Like an old shoe. One Alliance member hates Irv and keeps changing the rules to thwart the Jamaican team. Even after they qualify, they’re disqualified. Irv storms in on the Alliance board meeting (the members aren’t piggishly smoking cigars, sadly), and gives an impassioned speech. They get a call. “We’re back in!” Irv says. We steadily make it to the end. We’ve grown with the team. We’ve seen that they can do it. They’ve overcome adversity and pettiness. Now, they’re here. They’ve made it. They jump into their sled. Sanka calls, “Feel they rhythm! Feel the rhyme! Get on up! It’s bobsled time! COOL RUNNINGS!” And take off! They’re going in record speeds! The world has Jamaica fever! But, a bolt comes loose and they crash. The real-life footage of the real-life team crashing is shown. We get close-ups of the harsh crash. They come to a halt way ahead of the finish line. “We have to finish the race,” Derice says. Battered, they stand and carry their sled across the line. The entire crowd does a slow clap. Junior’s disapproving, stern father shows his Jamaica t-shirt. The jerky Swiss guy congratulates Derice. Standing together, they get their photo taken: the team that did it! The team often crash lands. I enjoy this film. It’s upbeat and fun. It is extremely cliche, and conforms to a strict sports movie mold. There are absolutely no surprises. Not only can you guess specific lines of dialogue, you can call whole scenes ahead of time! The thing I disliked most is that ending. The team really did crash and come dead last. I don’t know the truth, but I suspect it wasn’t because of a loose bolt. See, if they just crash, that makes them look incompetent. And then what was the whole movie for? It has to be force majeure, something out of their hands that fells the team. I expect these movies to be a little false. (In reality, the team was greeted with open arms by the Olympic community.) Life isn’t as neat and tidy as a movie. But to go that far out of the way to both conform to the cliche and be true to the real life incident is just astonishingly audacious. 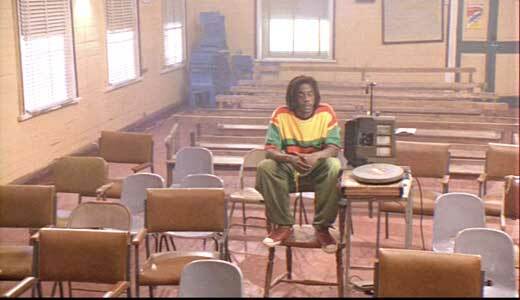 At the first recruitment meeting, Sanka is the only one left at first. But this movie isn’t for me. It’s for kids who likely have never seen any of a thousand exactly similar inspiring sports movie and, to that, this is a success. I totally support a film where adults deal with real problems and overcome adversity over, say, a film where a self-entitled teen is snubbed by his peers but gets super/vampire powers and saves the world. Shows them! 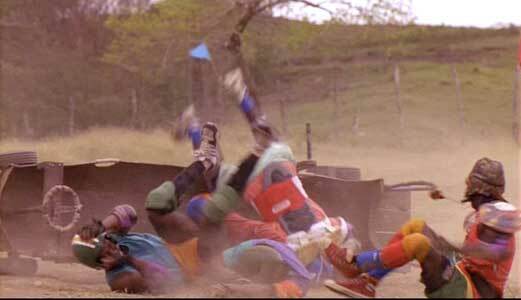 Cool Runnings may not be accurate to a T and is ultra-cliche, but it’s fun and it’ll have kids rooting for Team Jamaica. Harmless fun that holds up 18 years later. 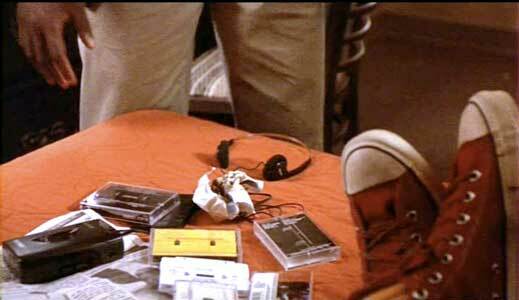 Sanka wears red high top chucks most of the time, even in Calgary. Sanka has his push cart team say their pledge. 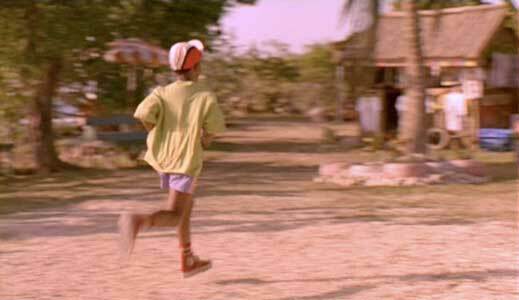 Throughout the film, Sanka wears red high top chucks along with bright, over the edge, multi-colored clothing. In his first scene, he’s shown in a push-cart, leg dangling over the side, wearing his red chucks. The film is letting us know this guy is going to be our source of funny for 90 minutes. Sanka is line dancing in a Calgary bar. 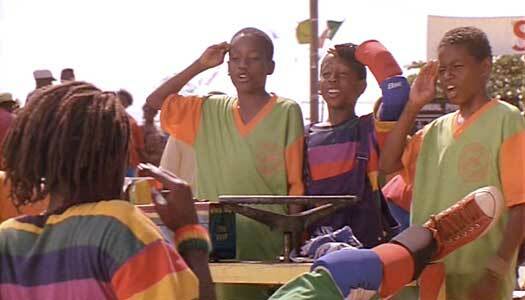 Later, Sanka is with his teammates in a bar. To show a contrast between the fun-loving guy and the conservative Calgary folk, we start with a low shot of his red chucks while he attempts line dancing. One demerit: The team’s athletic gear is Adidas brand (even though they’re supposed to be on very limited funds). 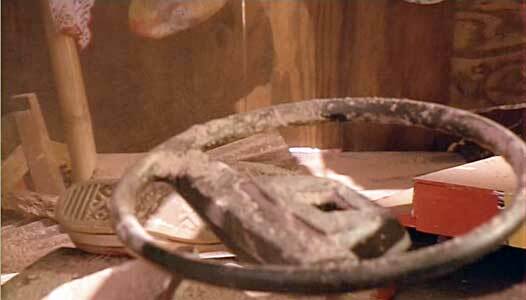 After a serious push cart crash, all we see of Sanka is the sole of his right chuck. 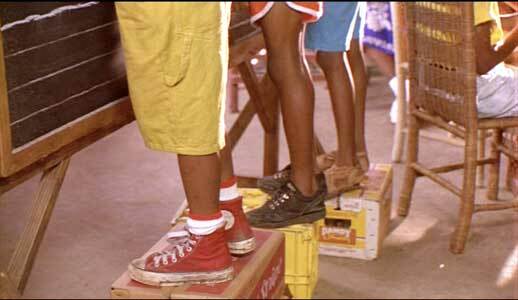 Also wearing red high top chucks in the film is Kerwin Keir, one of the two boys on Sanka’s push cart team. Toward the end of the film, there is a great dissolve shot from the Olympic action in Calgary to a Jamaican beach, where we see Keir running in his red high tops to the village restaurant where everyone is gathered to watch the bob sled team. Kerwin Keir running to the village restaurant. Later we see him on standing on a box, writing down the scores from the bobsled events. Kerwin standing on a box posting a score. Cool Runnings. (1993) Leon, Doug E. Doug, Rawle D.Lewis, Malik Yoba, John Candy, Kerwin Keir. Directed by Jon Turtelltaub. Categories: Comedy, Sports.